The Final Secret Wars Sales Update: Rebirth, or Just Death? – AiPT! The Final Secret Wars Sales Update: Rebirth, or Just Death? The end of Marvel’s grand Secret Wars experiment is upon us. Sort of. While nearly all the forty-something tie-in books have reached their conclusions, making way for the slow roll-out of the “All-New, All-Different” relaunch, the main book that enabled it all still has two issues to go (with a ninth installment being added at the eleventh hour), and will not completely wrap up until December — three months later than originally planned. Have these delays affected sales any? Did momentarily replacing every title result in a net benefit or loss? Has all this made readers eager for the relaunch, or ambivalent? Here’s our last look at the numbers, and comments from actual retailers! The first issue of Secret Wars landed with a tremor not unlike two universes colliding, dropping over half a million copies in a time when only a few books each month can struggle past 100,000 shipped. Issue #2 snuck in at less than half its predecessor’s sales — understandable, as they both released in May and there was no way for retailers to accurately judge what demand would be like. People always buy #1’s, but many don’t continue past that point. A quick eyeballing of recent charts suggests that drop-off is usually on the order of 40% or so, so figure in the extra units bought to score some beaucoup variant covers and we see that the savvy retailers played this one just as the market would suggest. But then the damnedest thing happened. People really liked the story. So much so that in June another 5,700 copies of issue #2 were shipped, along with 8,000 more copies of Secret Wars #1! By now retailers must have had time to adjust their initial orders, because issue #3 topped issue #2 by more than 7,300 copies. Secret Wars became the rare story that actually gained readers as time went on. The trend didn’t stop there. July’s Secret Wars #4 scored 3,000 more copies than #3, and all three previous issues also hit stores again, with #2 charging in at almost 10,000 more copies! August dipped when Secret Wars #5 shipped 14,000 fewer copies than #4 (still at a chart-topping 204,000), but amazingly another 5,000 copies of #2 were again pumped into the market. Incentivized variant covers can also boost an issue’s order numbers. And then … September was a deadzone. Issues #4 and 5 had been delayed, to not much of a detriment, but the ripple spread too far this month and Secret Wars didn’t ship at all. By the time #6 hit in October, the title had shed another 22,000 copies. It’s hard to know whether this is natural attrition or retailers adjusting orders during the gap to reflect a declining interest. “Judging by the parade of people I’ve had coming in looking for #6, I’d say that interest is still maintained,” said Peter Dolan of Middletown, N.Y.’s Main Street Comics before the issue was released. Further anecdotal evidence seems to back that up, as #6 still topped the Bleeding Cool “Bestseller List” for the week it finally appeared. Six retailers from across the country reported in that the most-delayed issue of Secret Wars was still bought more than anything else on the Wednesday of its release. That momentum slowed this month, when Secret Wars #7 was beaten by Batman and Darth Vader on the Bleeding Cool Bestseller list. 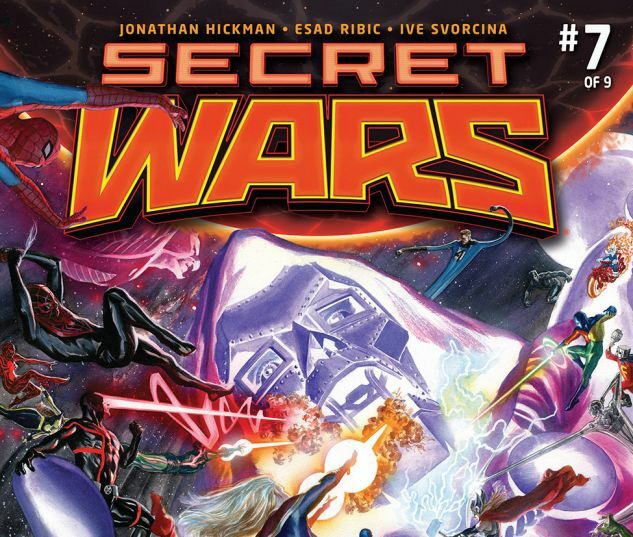 How will the final two issues of Secret Wars sell, when neither will arrive until December? Has delay-fatigue finally affected readers? Dolan doesn’t think so. “I think as long as the quality is there, they’re not going to give up,” Dolan said. “I had a couple of pretty dedicated Marvel readers who weren’t overly impressed with titles being canceled or put on hiatus,” said Haroon Mushtaq of the U.K.’s Traveling Man comic shop. Mushtaq has spent a decade at Traveling Man, and has been responsible for the ordering of new titles for much of that time. Assessing who would buy what from the flood of Battleworld-based titles was no easy task for him, leading to some tough guesswork when putting together initial orders. While many of the books sold gangbusters at first (see our report from July), not all could keep pace. “Some of the tie-ins do really well, but a lot of them fall by the wayside,” Mushtaq said. Amazing Spider-Man: Renew Your Vows was one of the few Secret Wars tie-ins that kept most of its readership throughout the summer. The numbers appear to agree. Marvel published around 80 different comics in March, prior to Secret Wars, to the tune of 2.72 million units in the Top 100. By the time most of the tie-ins ended in September, with just about the same number of titles being pushed out as in March, the total number of Marvel books in the Top 100 had declined to 2.37 million, a drop of about 13%. So when you factor in the bump from the initial #1’s, financially, the line-wide shakeup seems to be something of a wash.
And now Mushtaq and other retailers have had to do the same speculative dance they did last spring when ordering yet another batch of new titles, a slate that’s over 70, with new announcements still trickling in. The first stage of the “All-New Marvel” relaunch crushed in October, with 10 fewer titles than in September selling 3.9 million copies in the Top 100, leading to a clean sweep of the Top 10 and a nearly unprecedented marketshare advantage over the competition. Whatever else changes, it’s apparent that new #1’s are always bankable. Maybe that’s why Marvel will continue squeezing more out each month, into March 2016 and beyond. Behind that strategy, Marvel is taking another Secret Wars-level risk with their new line. Eventually the handful of remaining X-Men titles, the kooky septet of All-New, All-Different Avengers and all the niche books flooding in will have to sustain themselves. At least until the next relaunch. Are staggered #1’s, reliable sellers that they are, enough to float the hulking ship of experimentation? It’s obviously too early to tell, but it’s smooth sailing at the moment. “So far, so good,” Dolan said. Invincible Iron Man #1 took the top spot in October, but issue #2 tumbled to the 28th slot. Rock-steady Amazing Spider-Man put both its first two installments in the Top 10. All original data from http://www.comichron.com/.